<< Head back here to read the latest news. I also have several writing samples you can read. You can also feel free to read them and contact me with questions and comments. It's been a long time since I've had an update, but I've been busy with a health scare, buying a house and moving. But I wanted to make sure and talk about what a wonderful time I had when several people from the Dramatists Guild visited Denver this past weekend. Thank you Gary Garrison, David Faux, Roland Tec, and Seth Cotterman for coming to town from New York and making sure we know the Guild has our back. It was a very moving and rewarding message. Thanks to all who came to the event! One Night Stand Theater did an amazing job with performance of Lincoln on the Train last night at The Vintage Theatre in Aurora, Colo. Thank you to all my friends and family who were able to make it to the show! "One Night Stand Goes to War" is set for tomorrow night at The Vintage Theatre, in Aurora, Colo. They say some video might be along soon as well. More happy news. My short play, Lincoln on the Train, is going to be part of did a wonderful performance of Slipping into Anarchy early last year and I'm excited to see what they do with this piece. I hope all my Colorado friends will join me on Feb. 9 for the show! I get to end the year with some very good news about a new play! Spokane Stage Left chose my new one-minute play Boo Who for part of its Fast and Furious, the theatre's first annual staged reading of super-short plays. 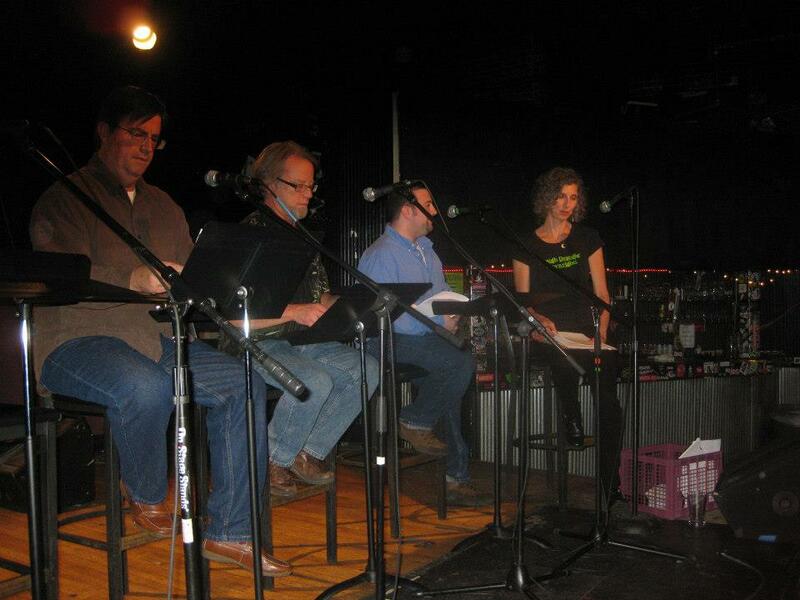 The staged readings are Jan. 31 and Feb. 1, 2014. Hooray! The performances of Slipping into Anarchy by the Modern-Day Griot Theatre Company in Brooklyn, NY are this weekend. The "See, Hear, Taste, Touch" festival is on Nov. 8-10. They even fixed the typo in my name on their website. If you're in the area, I hope you check it out! I'm very excited to announce that Slipping into Anarchy is going to be performed again this year! This time, The Modern-Day Griot Theatre Company in Brooklyn, NY is performing the play as part of its "See, Hear, Taste, Touch" evening. The festival is on Nov. 8-10, so just around the corner. Click here to visit the theatre's website for more information (They have a typo in my name there, but I'm hoping they'll fix it soon). This is the third production of Slipping into Anarchy this year and the second in the New York area! Hooray! Isn't it awesome? They let me take it home. I now have the schedule for Chameleon Theatre Circle's 14th Annual New Play Festival on Saturday, Sept. 21 in Burnsville, Minnesota (just south of Minneapolis). My children's play, The Worst Play in the History of Ever, will be performed at 1 p.m. I hope you can be there because I will be - I'm flying up there to see the show! I'm very excited to see this play performed. It will be a good time! Sorry for the long-term silence, I've been writing and submitting and I finally have some good news to share! My children's play, The Worst Play in the History of Ever, was picked to be part of the Chameleon Theatre Circle's 14th Annual New Play Festival. The schedule is still forthcoming, so I'll announce more details when I get them, but I do know the festival is on Saturday, Sept. 21 in Burnsville, Minnesota, which is just south of Minneapolis. This is the second festival for my children's play this year! Very cool! I made some updates to my website today. My artistic resume now has it's own page: jeffreywolfplays.com/resume.html. I had to learn how to make an html table to do it and while it isn't fancy, I think it looks pretty good. My play, No Ideas Today, is a semi-finalist for the 2013 Minnesota Shorts Play Festival. While I'm among 127 semi-finalists, it's still good news. Click here to see the full list of the plays. Finalists will be announced on Sept. 6. 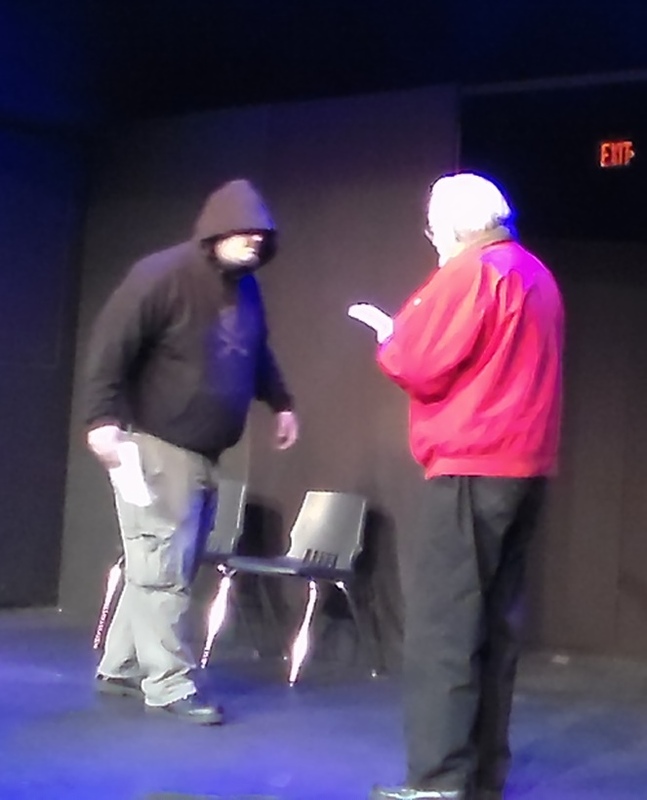 From what I hear, the performance of my The Worst Play in the History of Ever, at the 2013 Ronald M. Ruble New Play Festival in Ohio went really well. I feel so honored that the Caryl Crane Youth Theatre selected me to be part of it. The 2013 Ronald M. Ruble New Play Festival in Ohio is this weekend at the Caryl Crane Youth Theatre. My children's play, The Worst Play in the History of Ever, is set to be performed this Saturday at noon. I hope you can attend! Isn't that cool? If you're in the area, go see the show! Exciting news! 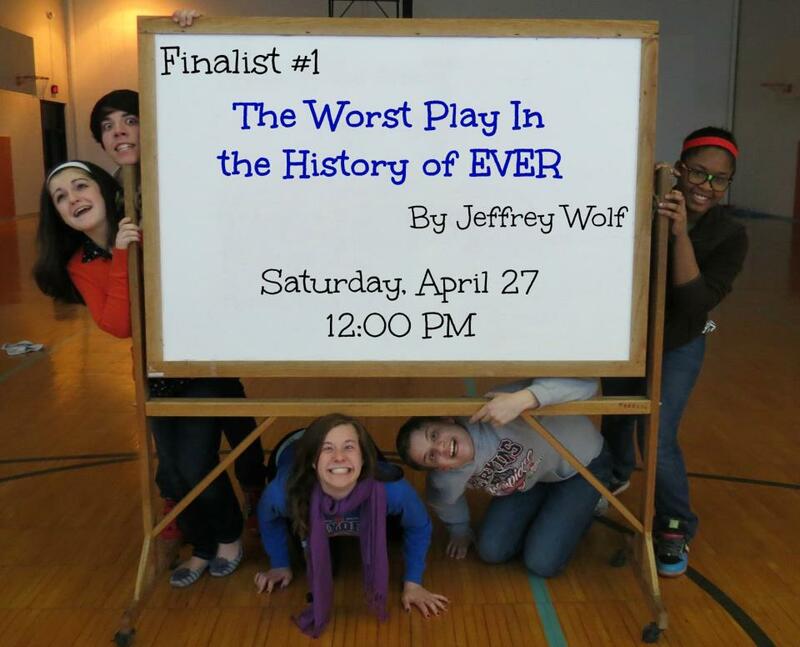 My children's play, The Worst Play in the History of Ever, was selected for the 2013 Ronald M. Ruble New Play Festival at Caryl Crane Youth Theatre in Ohio. The festival is April 27-28, 2013. 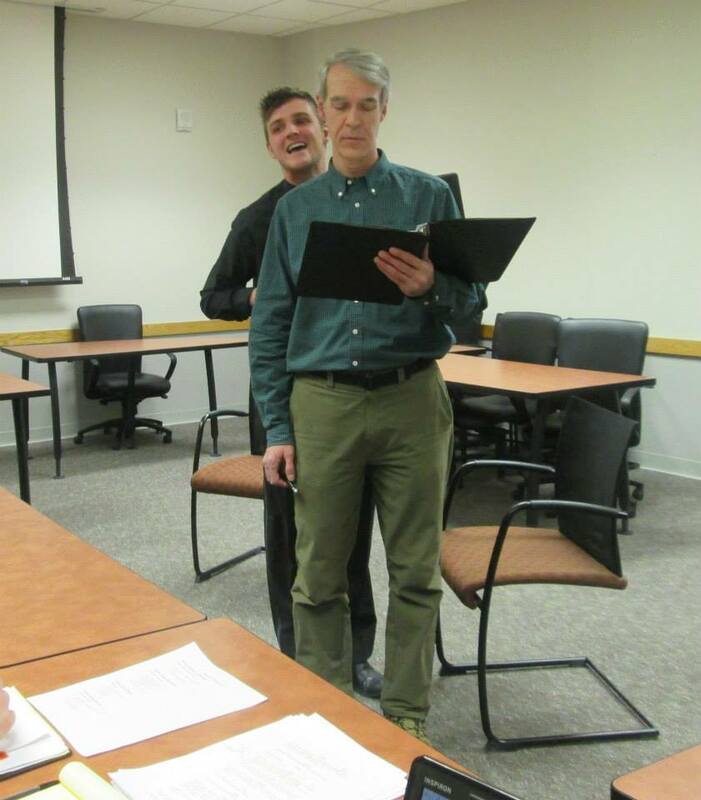 They will perform my play at noon on Saturday, April 27. It is one of five in the festival. If you are in the area, I encourage you to see it and tell me how it is. Hooray! What an incredible weekend! I traveled to New York and survived a blizzard named Nemo to see a great performance of Slipping into Anarchy by Snorks and Pins Productions in their festival: By the Light of a Match: Bad Love. It was such an honor to be part of their festival. Then, on Sunday night, One Night Stand Theater performed Slipping into Anarchy as part of their Hearts on Fire night at the Vintage Theatre. My plan apparently landed just as my play began, but I've heard from many people that it was really great. 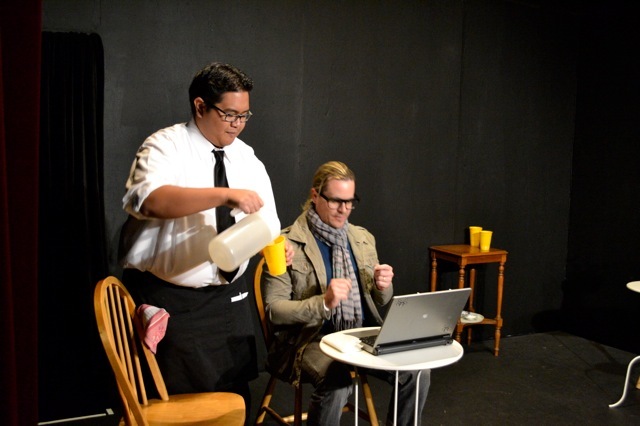 Thank you to One Night Stand Theater for including me and doing such a wonderful job! Here's to more weekends like this one (maybe without the blizzard) in 2013! 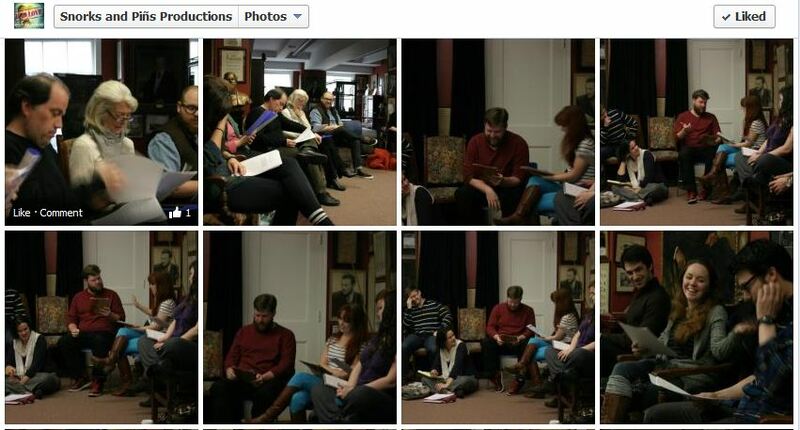 Snorks and Pins Productions posted some pictures of a rehearsal for their festival on Facebook. I'm not sure if any of the pictures are of Slipping into Anarchy because it's just one of the plays included in the By the Light of a Match: Bad Love festival in New York, but the pictures are fun! The dates are Feb. 8-9, so if you're in the area then, you should check it out. Also, my Colorado friends still have a chance to see Slipping into Anarchy on Sunday, Feb. 10. It's part of One Night Stand Theater's Hearts on Fire show at the Vintage Theatre in Aurora. The show starts at 7 p.m. I am proud say that my Colorado friends will finally get another chance to see Slipping into Anarchy! 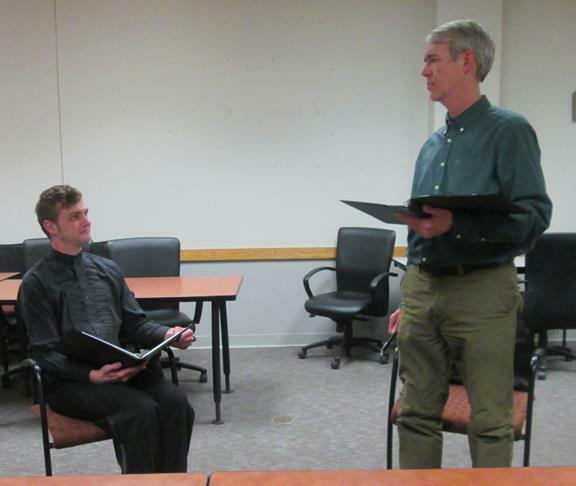 It is part of One Night Stand Theater's performance on Sunday, Feb. 10 at Vintage Theatre in Aurora. The show starts at 7 p.m. Many of my friends in Colorado always ask me when they can see this play performed and this is your chance! Additionally, Snorks and Pins Productions recently posted an interview with me on Facebook talking about Slipping into Anarchy as part of the promotion for the By the Light of a Match: Bad Love festival in New York. That is set for the same weekend as the performance in Colorado - on Friday Feb. 8 and Saturday, Feb. 9. It's pretty cool that once again Slipping into Anarchy will have concurrent productions! The dates of the By the Light of a Match: Bad Love festival by Snorks and Pins Productions in New York changed. It is now Feb. 8-9, 2013. They selected Slipping into Anarchy to be part of the 2013 festival, so if you're in New York, I hope you can make it. I'm coming to see the show myself! Wonderful news! Slipping into Anarchy is nominated for this year's By the Light of a Match: Bad Love festival by Snorks and Pins Productions in New York. The performance dates are Feb. 15-16, 2013. So exciting! If you saw the production, let me know and tell me what you thought of it. 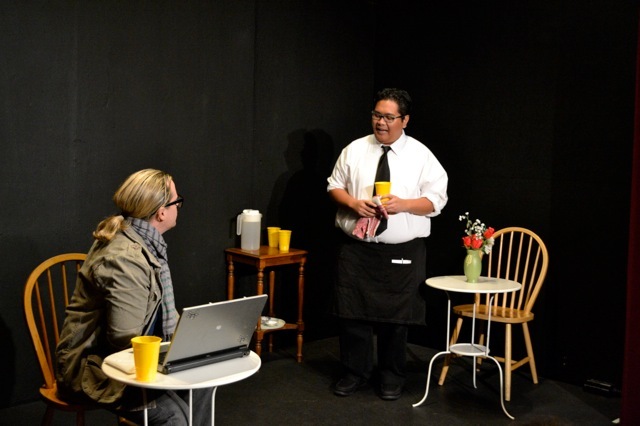 This weekend are the performances of No Ideas Today at the North Park Playwrights Festival in San Diego! The schedule goes like this: It will be performed on Oct. 19 and 20 at 8 p.m. and on Oct. 21 at 2 p.m. Break a leg to the cast and crew! If you're in San Diego, check it out and tell me about it. On Saturday, Oct. 13 (next weekend) my play Lincoln on the Train will be read as part of the Rough Draught Playwrights event. It's at Benders Tavern in Denver, so all my local friends can come and enjoy. Click here for more information. Hope to see you there! I just found out that my short play, No Ideas Today, was picked to be included in the North Park Playwrights Festival in San Diego! That's awesome! It will be performed on Oct. 19 and 20 at 8 p.m. and on Oct. 21 at 2 p.m. If you're in San Diego then, check it out! 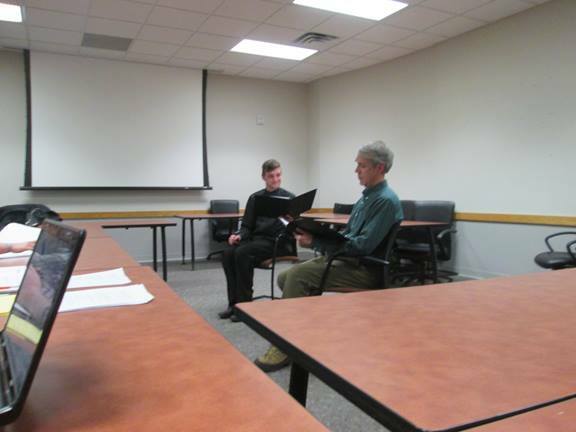 Yesterday's reading of Memories of Lost Time at The Edge Theatre's "On Your Feet" project went really well. It was a great experience and the director and cast did a great job. I can't wait to get started on my rewrites. We're getting close to the reading of 10 pages from Memories of Lost Time at The Edge Theatre's "On Your Feet" project. The reading is on Saturday, July 21 at 5 p.m. This is a nice chance for all my friends in Colorado to get to see something of mine. The Firehouse Theatre Project's annual new play festival in Richmond, Virginia starts tomorrow! Memories of Lost Time is getting a full staged reading. The festival goes for four days and my play is being performed on two of them. The performances are on Friday, June 29 and Sunday, July 1 - both at 7:30 p.m. If you're in the area, you should go! I did not win the vote in New York for Memories of Lost Time to become the premiere production by The Distilled Theatre, but I am so honored I made it this far. Thanks to all my friends and supporters who went to the reading and voted for me. Hopefully there are still big things in my future! Tonight's the night! The Distilled Theatre in New York is doing a reading of about 10 pages from Memories of Lost Time. Please go and vote! If I win, I get a production. 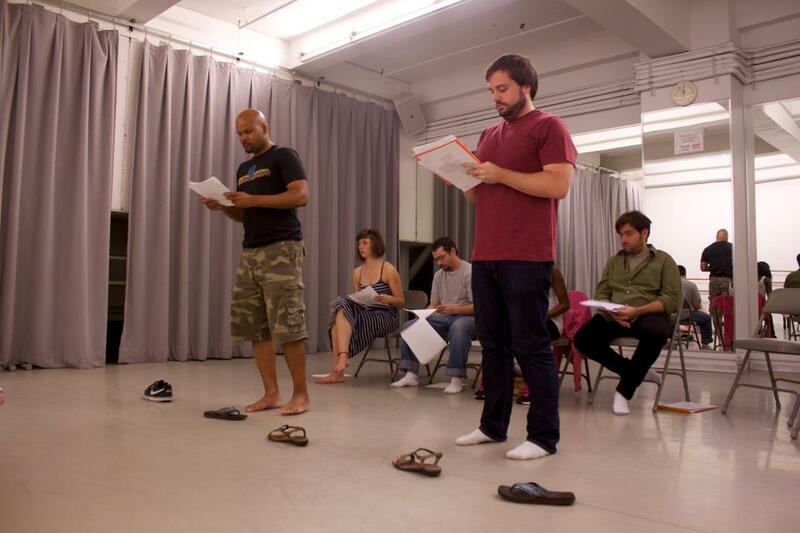 The reading is at Theatrelab Manhattan, which is at 137 West 14th Street (between 6th and 7th Avenues). There is a wine reception at 7 p.m. and after the show to announce the results. The show starts at 7:30 p.m. Tickets are $7. To make reservations ahead of time, email Distilledtheatre@gmail.com to reserve a ticket. I just got off the phone with my director of the staged reading of Memories of Lost Time for the Firehouse Theatre Project's annual new play festival in Richmond, Virginia and it was a great conversation. He's really great and I'm really confident he and the cast are going to do a wonderful job. I'm so honored to be part of this festival! I got a picture from the rehearsal of Memories of Lost Time by The Distilled Theatre. Cool! I heard today from the folks at the Salve Regina University play festival. They say the performance of Slipping into Anarchy went really well last night. That's always nice to know! I am pleased to announce that Memories of Lost Time was selected as one of the two winners of the Firehouse Theatre Project's annual new play festival in Richmond, Virginia! It's going to be performed on June 28, 29 and 30 and on July 1. Two big things coming up. Slipping into Anarchy will be performed in the Salve Regina University play festival on Thursday, June 14 at the Casino Theatre in Newport, Rhode Island. If you're in the area, make sure you go and check it out. Tickets are free! 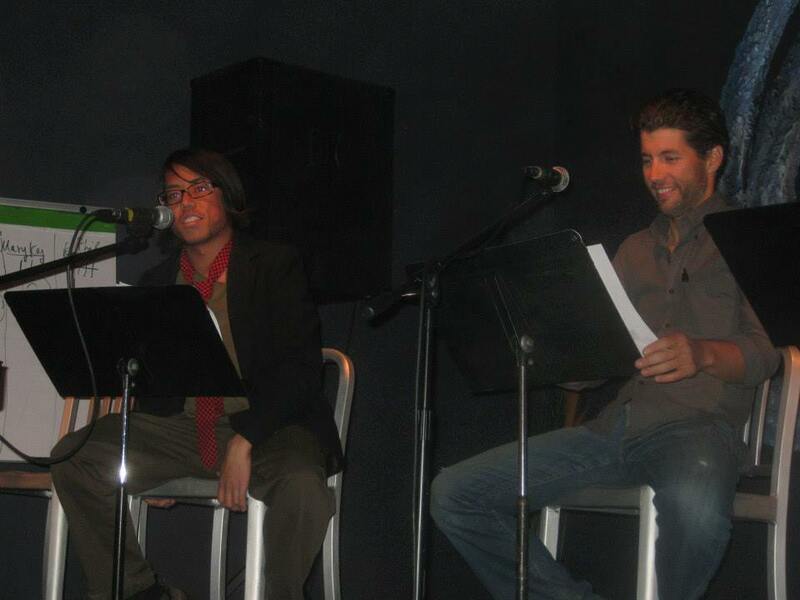 Also, The Distilled Theatre is reading about 10 pages from Memories of Lost Time on Thursday, June 21 in New York City. It is at Theatrelab Manhattan, which is at 137 West 14th Street (between 6th and 7th Avenues). The way this works is that the audience votes for their favorite and that play gets picked for Distilled Theatre's premiere production. There is a wine reception at 7 p.m. and after the show to announce the results. The show starts at 7:30 p.m. Tickets are $7. To make reservations ahead of time, email Distilledtheatre@gmail.com to reserve a ticket. The reading for Memories of Lost Time through Distilled Theatre got moved to Thursday, June 21 and I have all the details. It is at Theatrelab Manhattan, which is at 137 West 14th Street (between 6th and 7th Avenues) in New York City. There is a wine reception at 7 p.m. and after the show to announce the results. The show starts at 7:30 p.m. Tickets are $7. To make reservations ahead of time, email Distilledtheatre@gmail.com to reserve a ticket. I really need all my New York-based friends to go because they will decide on which play gets produced by an audience vote. Please go and vote for Memories of Lost Time! I have the details on the performance of Slipping into Anarchy in Rhode Island. It's in the Salve Regina University play festival and will be performed on Friday, June 15 at the Casino Theatre in Newport. Also, Slipping into Anarchy is still being performed by MadLab Theatre in Columbus, Ohio and the next show is tonight. Make sure you check it out if you're in the area. I just learned that Memories of Lost Time was chosen among eight finalists for the Firehouse Theatre Project in Richmond, Virginia. They are still picking the top two and then those two will get a full reading on June 28 to July 1. Very exciting! 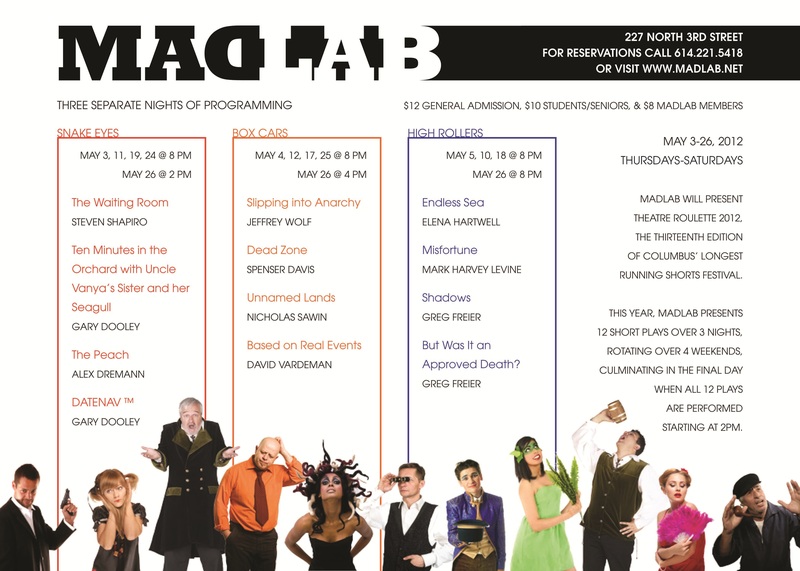 Also, tomorrow is another performance of Slipping into Anarchy at MadLab Theatre in Columbus, Ohio. Make sure you check it out if you're in the area. 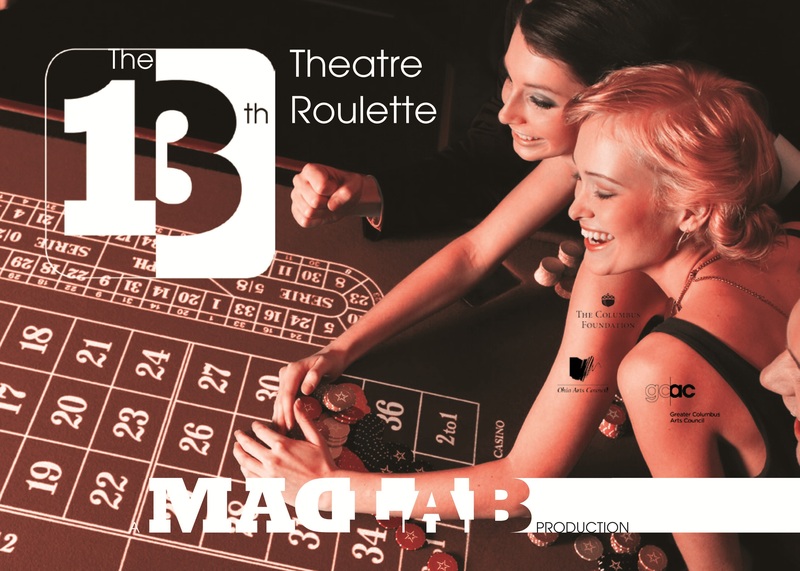 You can still see the show on 5/12, 5/17, and 5/25 @ 8 p.m. and on 5/26 @ 4 p.m.
MadLab Theatre's 2012 Theatre Roulette begins tonight in Columbus, Ohio. The performances of Slipping into Anarchy begin tomorrow. If you're in the area, I hope you'll go see it. The entire list of plays seems really delightful and I'm sure you'll enjoy yourself. Also, here is the official announcement from The Distilled Theatre about the reading (and possible production) of Memories of Lost Time. I'll get details about the reading soon. This is becoming a great spring for me! I just heard that a theatre in New York City, the Distilled Theatre, wants to do a reading of Memories of Lost Time. They plan to do it on Thursday, June 7! They will do 10 minutes of the play and then the audience will vote for their favorite and the chosen show will get a production by the theatre. So if you're in New York on June 7, please go and see my play and vote for it! Also, the MadLab Theatre in Ohio has a full slideshow up of production photos for the upcoming production of Slipping into Anarchy. Go here to check it out! So here is a very strange story. 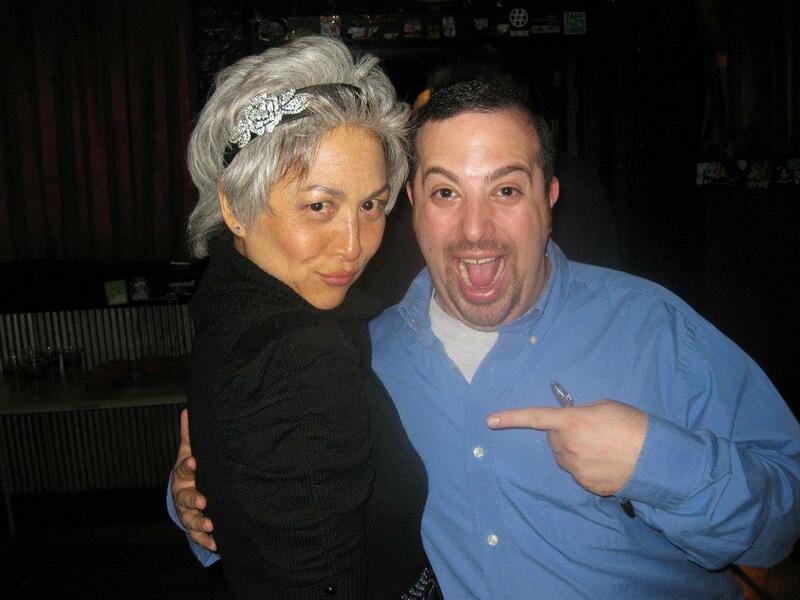 Yesterday, I'm talking to my friend Jeffrey Neuman and he tells me: "Did you know we were in a festival together?" Apparently, Slipping into Anarchy was performed in November 2010 and I had no idea. It was through the Magnolia Arts Center in Greenville, North Carolina. Now, I'm very happy that more people got to see the play and I'm sure it went over well, but I'm disappointed I wasn't told because I have family in North Carolina that only lives about 90 minutes away from Greenville. If I had known, they would have gone to see the show. Theatres, if you're going to do a playwright's work, please let them know. We really like to hear about it. 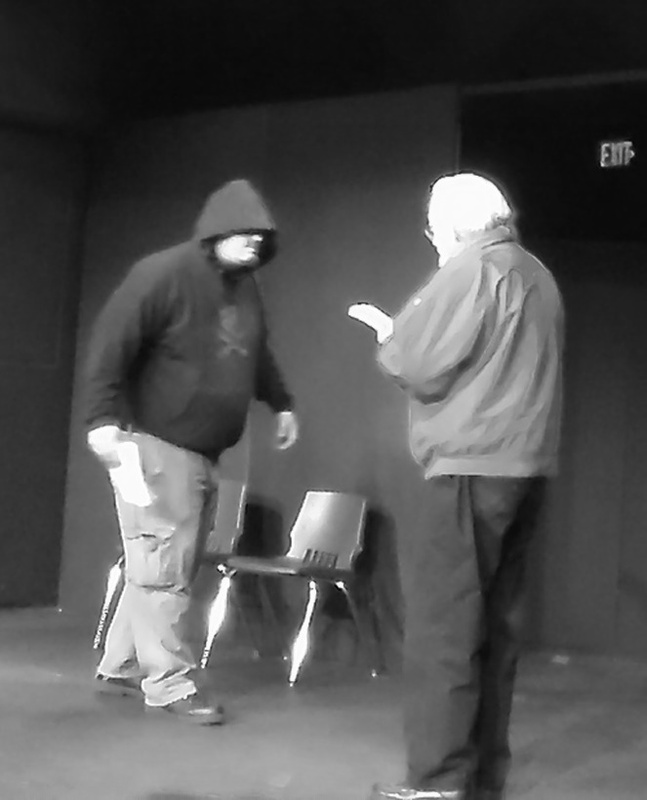 Tech rehearsals have begun for Slipping into Anarchy in MadLab's Theatre Roulette 2012 in Columbus, Ohio. The producer of the show sent me a shot of the cast rehearsing and a copy of the flyer. Those are below! My play will be performed on 5/4, 5/12, 5/17, 5/25 at 8 p.m., and 5/26 at 4 p.m. If you're in the area, you should go and tell me how it is. I'm pleased to announce that Slipping into Anarchy was selected as part of the Salve Regina University play festival. That means it will be performed on June 14 or 15 at the Casino Theatre in Newport, Rhode Island. So exciting! This weekend I had my last class at The Lighthouse with Terry Dodd. I really wish I could take his next course, but I don't think I can do it right now. Sad face. It was a great experience over the past nine weeks and it got me into a great place with my children's play. I'm a little sad because I brought the first few pages of Memories of Lost Time for the last class and it would have been nice to get more from them in the coming weeks. Maybe I'll win the lottery on Wednesday and get to take the class. Of course, I have to remember to play the lottery on Wednesday.... On a different note, I'm still trying to figure out which pages to pick for my workshop in July. It's proving to be very difficult. I really wish we had enough time to do an entire scene. Especially the first scene, but that's onto 28 pages and I think that's unfair to people who only get 10 pages. I'm gonna chew on which pages to do for a few more days. Hopefully something will come to me. I am happy to announce that as part of The Edge Theatre's "On Your Feet" project, Memories of Lost Time will have 10-12 pages read on July 21. The event goes from 3 to 6 p.m., but I think it's a workshop with me until 5 p.m. and then that's when they'll do the reading. I am so excited about this process and can't wait for July to get here! I saw Melancholy Play tonight up at CU Boulder and it was fun. It's a very bizarre show but it has some great moments and is often laugh out loud goofy. The girl at the box office told me to embrace the goofy when I bought the tickets and she was right. Stay tuned for more about the "On Your Feet" stuff. I should get a big update tomorrow! I found out over the weekend that Memories of Lost Time is a semi finalist for The Edge Theatre's new play festival. More details to come! It's been a heck of a weekend. I don't think I've ever seen this much theater over a three-day span and I'm not done yet. I attended the Denver Center's New Play Summit. That included five plays. Some of them were very good and some not so good, but it was really good to see new theater being done. That's important for all playwrights. Many theaters are afraid of new theater because they know the classic shows are often guaranteed to make them money. It's good that any theater takes risks on new plays. I also caught 9 Circles at Curious Theatre and that is an amazing experience. I recommend it to everyone. Tonight, I'm looking forward to the latest One Night Stand Theatre. My friend Jeffrey Neuman's play is being read and it's a good one! Yesterday's Lighthouse writing class went well again. While the class seems to be shrinking, I think that may only make it better. They are really grooving on my children's play and I think I'm going to send it out for the first time this weekend. I also saw "The Whale" at the Denver Center yesterday. Wow. It's a very powerful play and I recommend it. I thought the ending was a bit jarring and the play could have used a denoument, but overall it was a great experience. Lots of little tidbits. First, No Ideas Today, was named as a semifinalist for the Lakeshore Players' 8th Annual Ten-Minute Playwrighting Contest in Minnesota. Next, I've been passing around my children's play, The Worst Play in the History of Ever and people have generally really liked it (let me know if you want to read it). I've shown the first act to both my Lighthouse class and my Meetup group and they laughed a lot. So far, everyone has agreed there was too much pig latin so I took a bunch out.... Perhaps most important, I'm an uncle again. My nephew, Zane Daniel Wolf, was born just a little over a week ago. He's very cute. I had my first playwrighting class with Terry Dodd at the Lighthouse yesterday and it was really cool. Terry is such a wonderful teacher. He really knows how to articulate thoughts in a way that is constructive. I can't wait until next week! I know this is belated, but happy new year everyone! This year already has exciting things on the horizon. Slipping into Anarchy is set to be performed as part of 2012's Theatre Roulette at MadLab Theatre in Columbus, Ohio. I'm also signed up for a playwrighting class taught by Terry Dodd at the Lighthouse Writers Workshop. I'm really looking forward to this class and think it will be so rewarding. Yesterday, I also attended one of my Meetup.com writers groups. We read through the first act of my recently completed children's play and it went over well. I got a lot of really good feedback about ways to improve the first act and I can't wait to see how they react to the second act. 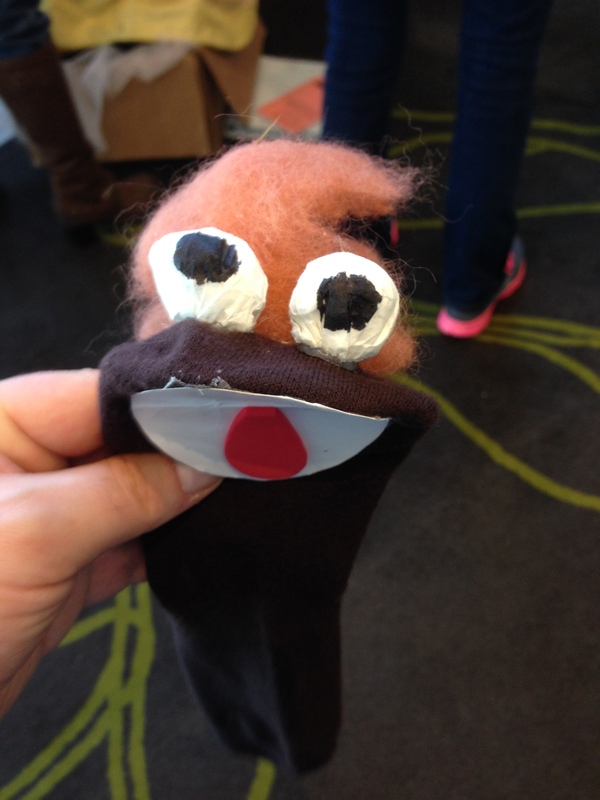 It has sock puppets, pig latin and musical numbers. Keep it coming 2012! 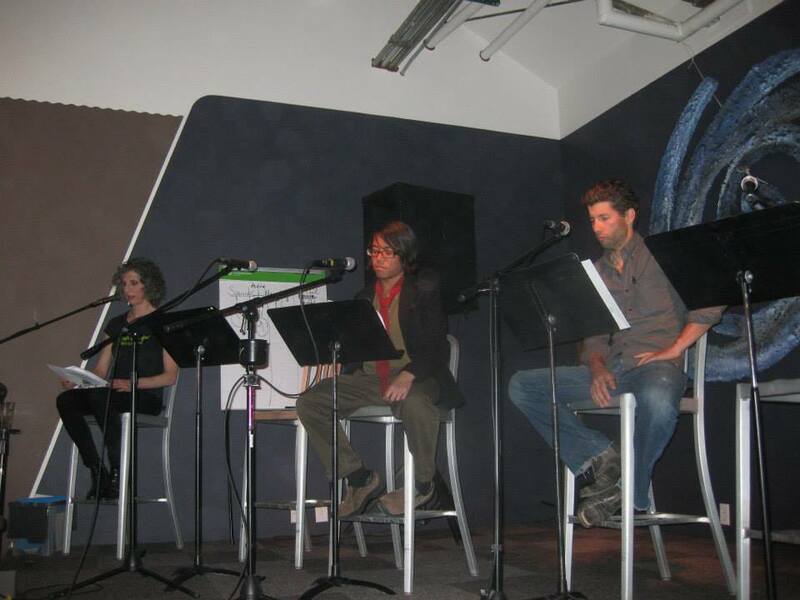 Last weekend, I went to this cool reading at the Lighthouse Writers Workshop. I was invited by a fellow writer I've met through a Meetup writing group. I was totally blown away. Not only was it completely amazing to be around other writers, but the readers I got to here were awesome. It made me even happier to be there because I was not only surrounded by writers, but by people who know what good writing is and enjoy it. I think I'm going to take a class at the Lighthouse in the new year, if only to be a part of this amazing collective. Exciting news! Slipping into Anarchy was chosen to be part of 2012's Theatre Roulette at MadLab Theatre in Columbus, Ohio. Very exciting! This is a great theatre that only does new works. Has anyone been to Columbus? Do I know anyone who lives there? It's that time of the year. Happy Holidays to one and all! I hear the performances of The Department of Famous Last Words went well in Pittsburgh. Wish I could have been there. Let me know if you saw it. We did a story at work this week about a jail inmate who died from a heart attack because they waited 18 minutes to give him CPR. I got a bit fired up when I proofread it, so to accompany the piece, I wrote a blog about what it's like to have a heart attack. Click here to read the blog. I hope you enjoy the blog. I feel pretty strong about the whole thing. People have told me I should write a play about the experience, but I am not sure I have ever quite come to terms with it. More than six years later, it's still hard for me to put into perspective. In other news, the performances of The Department of Famous Last Words begin next weekend! To learn more, visit Future Tenant's website. I really hope it goes well and it's a shame I won't get out to Pittsburgh to see it. If you're in the area, see it and tell me how it goes! I've decided to start writing a book on Twitter. You can follow it @JWolfBookFeed. I think this will be fun! Lots of news! First Starters is being considered for publication by Heartland Plays, Inc. So excited about that! And I heard from my director today about the production of The Department of Famous Last Words coming up in a few weeks at Future Ten in Pittsburgh. It sounds like it's going to be a great production. More details on things to come soon. 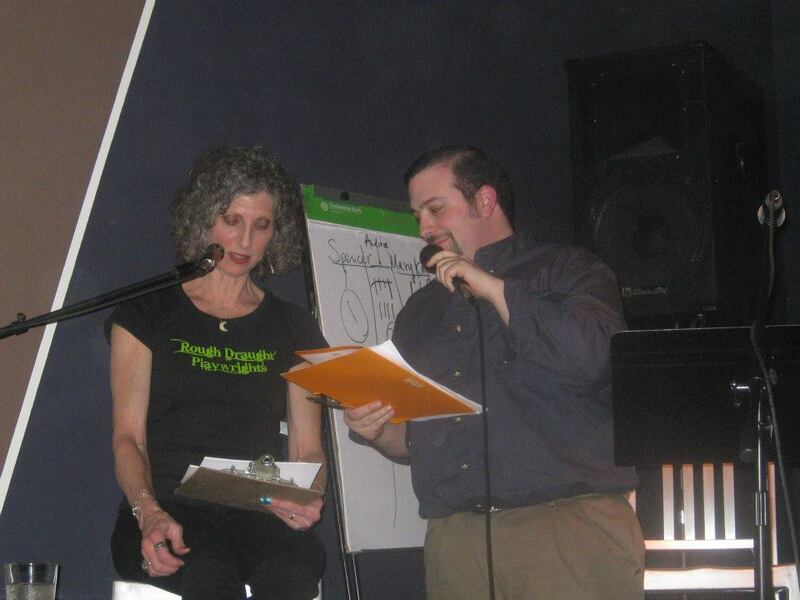 I had a lot of fun at this Speed Dating for Playwrights thing on Saturday. It was a bit crazy - there were four producers from local theaters and I had four minutes with each to pitch them a play. It was nice to meet all of them, but I was actually out of breath when it was all over because I was talking so fast. Two of the producers asked for Memories of Lost Time so we'll see what happens with that. The Department of Famous Last Words has been selected as part of the Future Ten play festival in Pittsburgh!!! Auditions are Sept. 17 and the performances are Nov. 3-5 and Nov. 10-12 (two weekends!) at 8 p.m. So exciting! I miss having a writer's group. I had one several years ago (wow, I think it was like 10 years ago!) but it broke up as they eventually do. Creating a group is really difficult. Not only is it hard to find people with matching schedules, you need to find people you can trust and who won't get offended by you and won't offend you. It's a careful balance. That being said, if you're interested in forming a writing group, go ahead and email me at wolfwink2@hotmail.com. I got a letter letting me know that Memories of Lost Time is one of 11 finalists for SART's ScriptFEST 2011! It now moves into a new phase of their process and they pick four or five scripts from that. Even if I don't move on (which I really want to), this is still some really great news! Keep your fingers crossed for me! I get lots of rejections. It's sort of the nature of being a playwright. You get a lot of people who just say no. Sometimes it's easier to take than others. I've talked about with friends how getting a play produced is a little like getting struck by lightning. It's hard to make happen. I do a lot of submissions. A really lot. I did more than a dozen last week. To keep track of all my submissions I have an insanely large spreadsheet. Seriously, it's already got more than 480 rows. I also color code it. Green means that I've submitted but haven't heard back. Red means they've said no. Blue means they said yes. There's a lot of green and a lot of red, but not a lot of blue. That's disappointing, but I'm more positive about it some days than others. I always think I just need one big success and that will lead to many more. I'm not sure that's true, but it's helpful to have that dream. Lots of submissions going on... not a lot of response. There's always a bit of a let down after a play is all over. It's a big emotional high and you miss the anticipation and excitement. I'm also trying to figure out what to do next. These playwriting things are great because they're very inspirational, but afterwards, I feel as if I'm pulled in a million different directions and never have the time to do what I want to do. It would be nice to get another success soon. I'm still sending stuff out every week, so we'll see what happens. The cast and director of The Benefits Are Good did an awesome job! I am so happy with them. It was a great day at the Playwright's Bootcamp and then at the Showcase. I talked to a lot of amazing people and learned so much. It's so good to be around people in theater. They are always respectful and friendly. It was a great day! Tonight's the night! 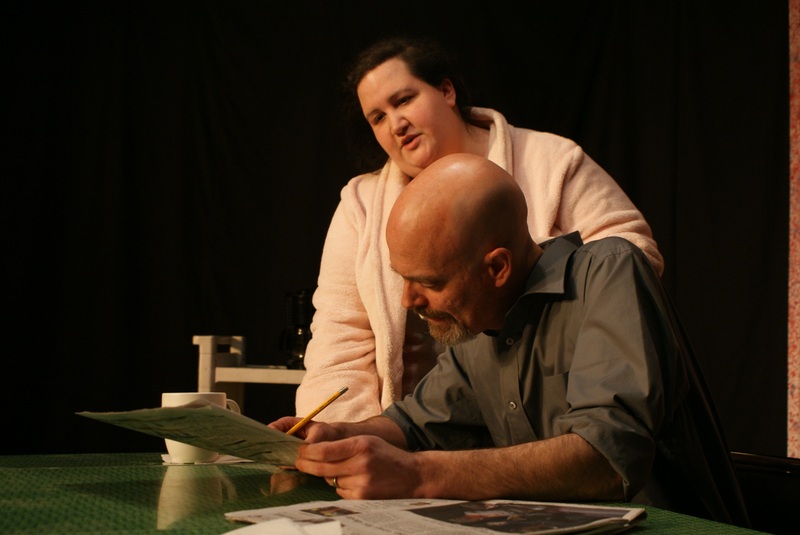 The Benefits Are Good gets performed at the Playwrights Showcase. They say reservations are going fast. You can get details here! It's also Celebrate Jeff Being Alive Day. It'll be a great one! One day away!!!! So excited for the Showcase on Saturday. Make sure you come see The Benefits Are Good! Details right here! I feel I'm overusing exclamation points!!!! Saturday (July 16) is also Celebrate Jeff Being Alive Day (not my birthday), so I'm thinking it will be a pretty good day! A play performance and I'm alive. I hope to go to dessert after the show, so let me know if you want to join me. So my director for The Benefits Are Good says they think a character was electrocuted. It's something they came up in rehearsal. I didn't write that (and I don't think I can add that because the people running the showcase have locked the scripts) and while I'm not sure it works with the script, I'm more curious how they got there. Electrocution, to me, isn't something that just comes up. And why electrocuted? They apparently like the idea that a character would be twitching, but I'm not sure that make sense either. Was it to explain the flopping around? Because I kind of tried to do that in the script. This is the part of being the playwright that can be the strangest. I've sent the play off to the director and just have to trust him. As long as the audience laughs, I'm happy. The performance is on July 16 at the Buntport Theatre. Want tickets? Get the details right here. We're just over a week away from the Playwrights Boot Camp Showcase and the first performance of The Benefits Are Good. Really excited! Come join me for the performance on July 16 at the Buntport Theatre. The details can be found here. My favorite quote from an email from my director about The Benefits Are Good: "At the end of the first rehearsal, I told the cast that I realized each of them needed to be dead in their own special way (not all physically moving in exactly the same way), so I'll see what they come up with." He also liked the buckets of water idea. I haven't gotten to go to any rehearsals yet, but they have begun for The Benefits Are Good. My director had a few questions about the script and my responses included using plastic fish or throwing buckets of water at the audience. I don't think either of those things will actually happen, but it's fun that they were possible responses about this script. A reminder that the performance is on July 16 at the Buntport Theatre. More information can be found here. Last night I had this dream where I was talking to class of playwriting students and listening to their short plays. (I've done this before for journalism students.) The plays were really good. I laughed out loud several times and was trying to write comments about them at the same time. But I woke up and couldn't remember the plays. Nothing. So I can't remember my own plays that someone else wrote. But I actually wrote them because it was my subconscious, so it's not plagiarism that way, right? I wish I could remember them. I'm actually seriously thinking about hypnosis. 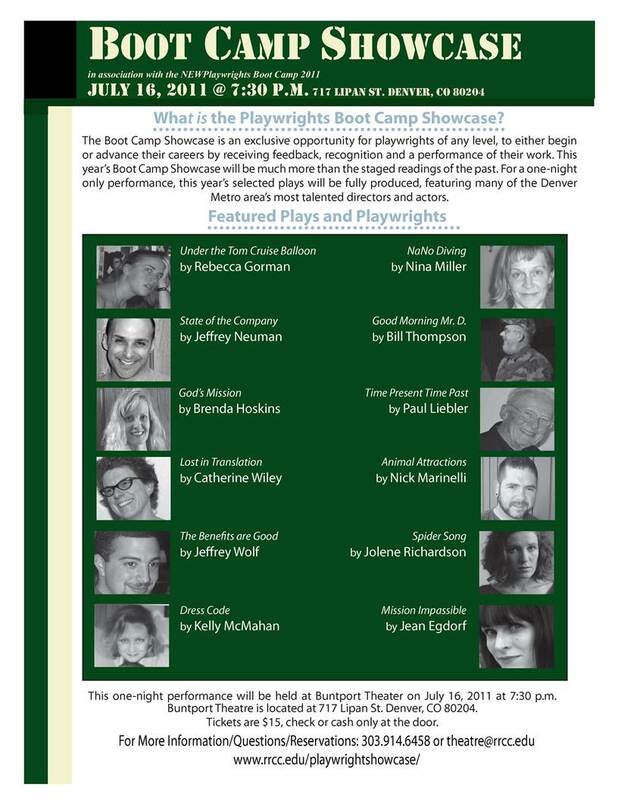 I am going to once again be part of the Western Playwrights Showcase Boot Camp Challenge. This is on July 16 at the Buntport Theatre. They gave us a prompt (this time it was "Mission: Impossible") and I wrote a six-page play called The Benefits Are Good and it was selected! For more information on the Boot Camp Showcase, visit their website. For more about my playwriting career, you can read my artistic resume.